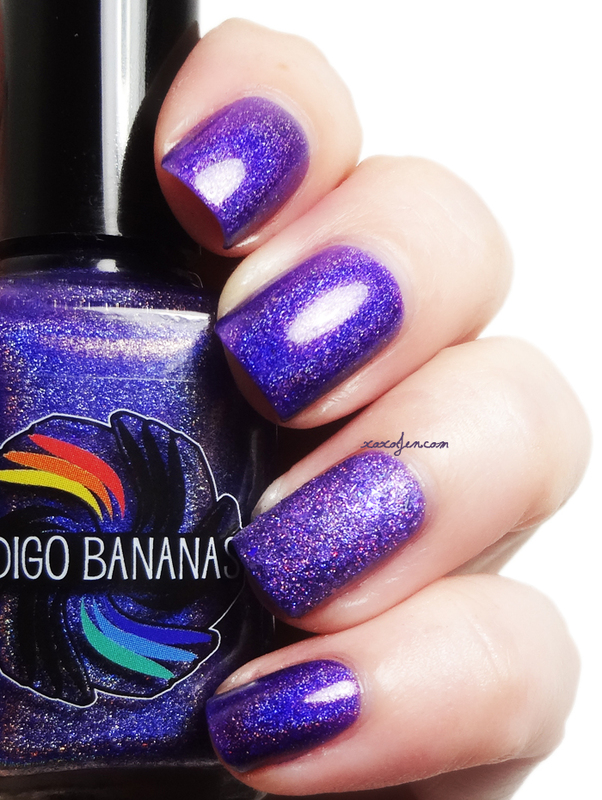 I recently purchased my first few Indigo Bananas polishes. What caught my eye was the super strong holographic rainbow in her shop photos and the vibrant colors. The very thought of those polishes kept luring me back to her shop page to see them again. At that point I knew I needed to pull the trigger and get a few. I purchased the first two and Andrea sent along a third polish as a gift. She shipped super quick and everything was packaged safe and snug for the journey to my fingertips. 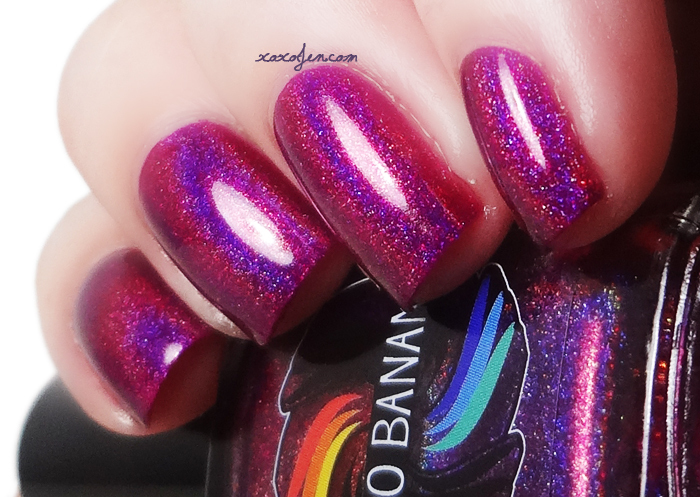 Rhythm and Booze - a very grapey purple with strong holo. I like a grapey purple (shocker! ), I mean, who doesn't? My accent nail is Lynnderella Violet in Lilac Velvet, a great color match for R&B don't ya think? 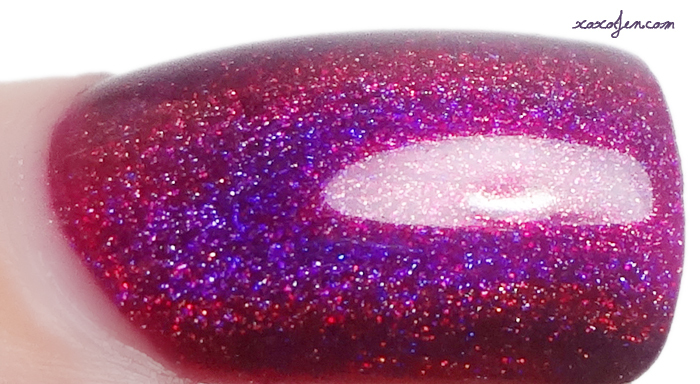 Polish of Unusual Quality - a super bright pink with super strong holo. 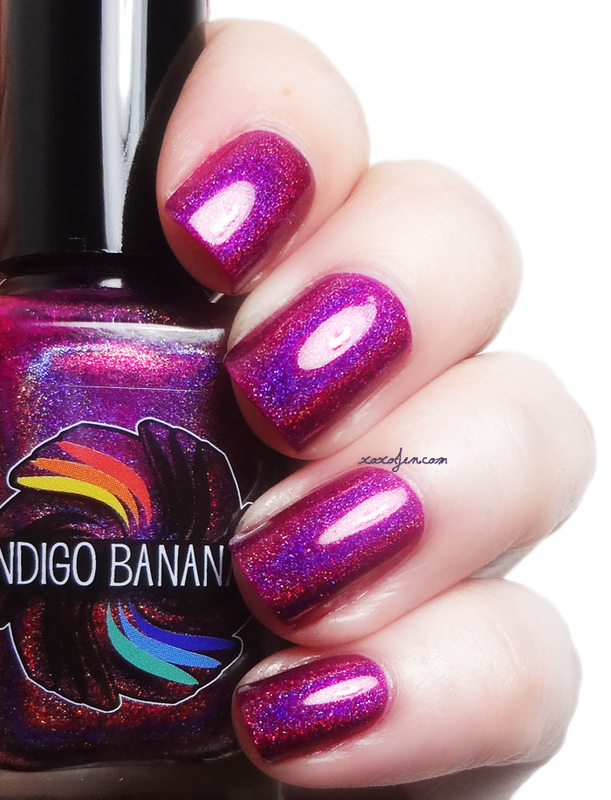 I like this IB polish better than CBL CBH because PoUQ is a brighter shade of pink and still has that purpley super strong holo rainbow. It is perfection, ya'll. I even did four photos of it instead of my usual three. I wore it first of these three, and didn't want to take it off. Like. Ever. If you don't have it, you need it. Like, now. Seriously. 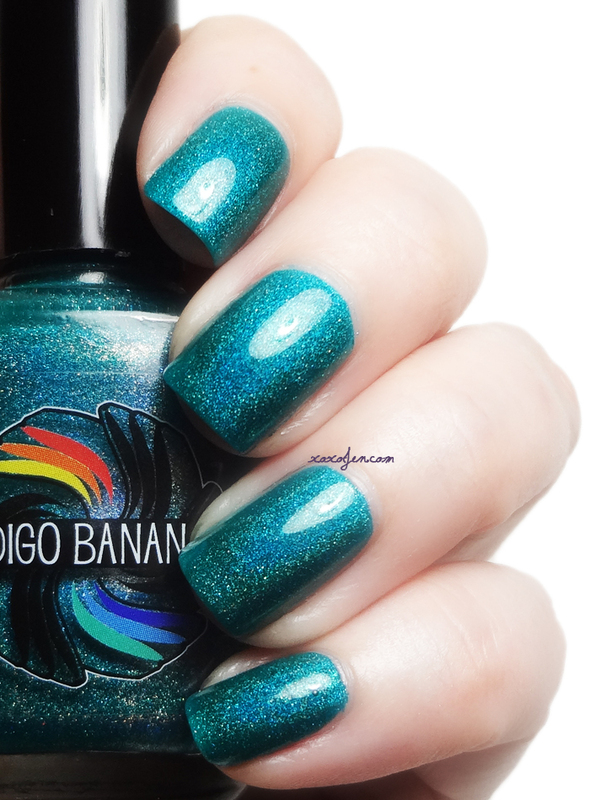 Shrieking Teals - a vibrant teal holo with a super flame! This is the polish Andrea sent as a surprise gift to me. It's such an enjoyable color, reminds me of the Pacific off the coast of Oahu. After using and wearing all three polishes, I can say they exceeded my expectations. The holo is so strong, it's even visible in most low/dim lighting. The formula is fantastic - so smooth, fluid, super easy to control, and opaque in one coat if care is taken to swipe the brush evenly. I paint in such a way that the middle of my nail gets more paint than the curved sides, so I always end up doing two coats to even it out. I like the bottle shape and the brush, and the label is fun with it's swirly rainbow of colors. On top of all this, the customer experience was stellar. Those are some really nice shades.